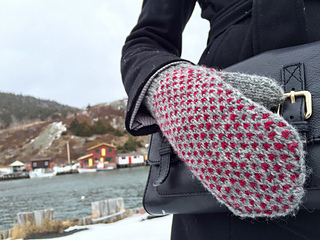 A simple colourwork pattern adds interest, density, and warmth to this basic mitten silhouette. The contrast colour looks like little hearts, which reminded me of the tiny community of Little Heart’s Ease in Trinity Bay; Newfoundland is known for its quirky place names. 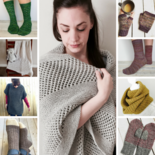 Columns of slipped stitches add polish, forming faux side seams to hide the jog that naturally occurs when knitting stranded colourwork in the round. Requiring little yarn for the contrast colour, this quick knit is a great project for using up leftovers of your favourite yarns and colours.